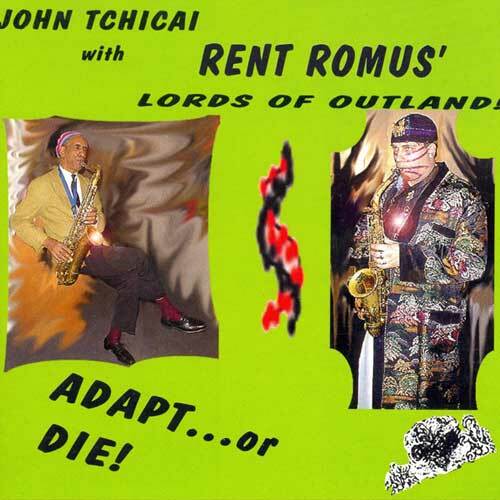 Edgetone Records, John Tchicai with Rent Romus' Lords of Outland – Adapt…or DIE! Rent Romus extends his ethos "to continually be on the path for something new" with the self-explanatory Adapt... or Die!. This recording revamps the Lords of Outland insto a more deviant configuration joined by drummer Dave Mihaly and sousaphonist Jon Birdsong. This project is also blessed with the immense presence of master tenor saxist John Tchicai. The shift in instrumentation provides a punchier, more expansive format for Romus' self-proclaimed "Nordic Viking Jazz" or "Bull in China Shop" attitude toward improv. With a post-grunge audacity, Romus kicks solos that he says come "straight from the groin" -- all of which bodes well for this sonic explorer.